Celebrating its 16th anniversary, The Boca Bacchanal Wine & Food Festival returns on April 6-7, 2018, with yet another incredible weekend filled with exquisite wine and fabulous food paired and presented by some of Boca’s very own world-renowned chefs. Presented by the Boca Raton Historical Society & Museum, this annual event brings wine & food enthusiasts together to celebrate and enhance the appreciation of fine wine & cuisine throughout the community. 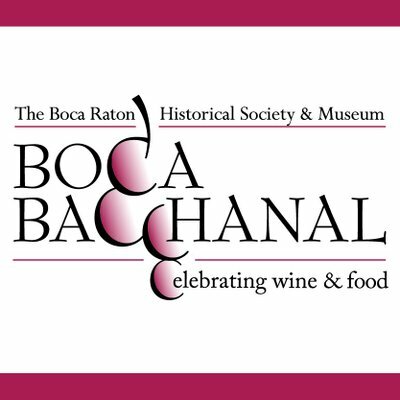 All proceeds from Boca Bacchanal enable the Boca Raton Historical Society & Museum to continue to provide and develop innovative, diverse, and rapidly expanding educational and historic preservation programs for Boca Raton area residents and visitors. This year’s festivities begin on Friday April 6, kicking the weekend off with the highly-anticipated vinter dinners which will be held at private estate-residences and historical locations throughout Boca Raton, including the Boca Raton Resort & Club. Each of these exquisite dining experiences will feature a vinter & chef pairing their cuisine and wine to create an intimate 5-course meal. Attendees will have the opportunity to meet their chef and vinter to learn more about the unique pairings of the evening.